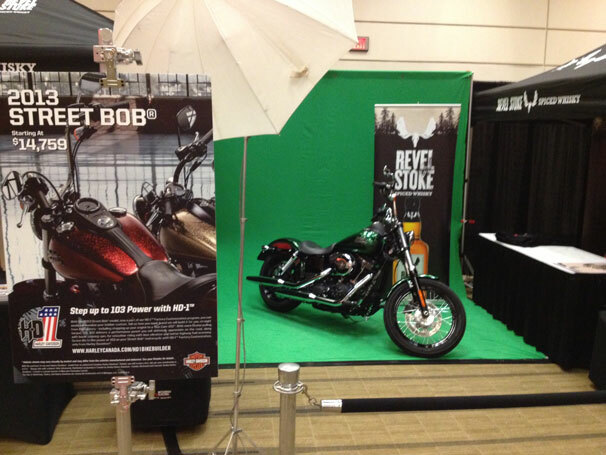 BEST BOOTH AT THE SHOW ~ A strategic partnership with Harley Davidson drove trial and raised a lot of interest for Revel Stoke Spiced Whisky. Show attendees were naturally drawn towards the Harley Davidson on display at the Whisky Live tasting event. Guests enjoyed jumping on the new StreetBob Harley Davison.Using green screen technology, each customer received a personal branded picture of themselves driving down through the mountains. Leather jackets and sunglasses became FUN props while tasting staff continued to create RAVING FANS by delivering a scripted trial experience with strong drive to retail.